Every now and then, country stars agree to take part in a commercial to speak on behalf of a product. Blake Shelton has done advertisements for Pizza Hut, while Willie Nelson has shown his support for Taco Bell. Reba McEntire is one artist who has appeared in her fair share of commercials, include bits for Fritos Texas Grill and The Beef Industry. But her most famous set of commercials had to be when she starred as The Colonel in a series of advertisements for KFC. Back in 2004, McEntire teamed up with another powerful voice in country music to promote one of the world’s most popular soft drinks…Dr. Pepper. The star that joined McEntire for this particular commercial was none other than LeAnn Rimes. To celebrate the commercial’s first airing, Rimes decided to share it with her fans on social media. “Hanging in the desert with Reba McEntire,” Rimes wrote in the caption that accompanied the video. The commercial was indeed filmed in the desert, and opens with Rimes driving down an empty road in a sporty convertible. She stops at an old motel, where McEntire is waiting for her with a can of Dr. Pepper to enjoy after making her long drive. After that, the two take off in the car and laugh and sing as they make their way to their next destination. That destination turns out to be a gas station, where the two women stop so they can enjoy more Dr. Pepper. Before they drive off, McEntire and Rimes toss a can of Dr. Pepper to the attractive attendant who helped them pump their gas. 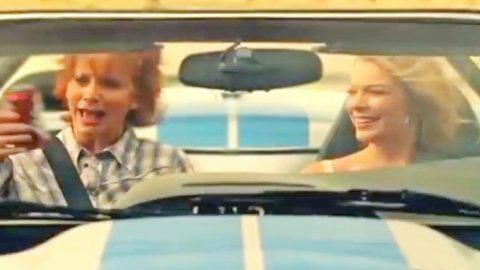 The commercial ends with the two of them driving into the sunset as they take off to find more wild adventures. While the song obviously mentioned Dr. Pepper, it felt less like an advertising jingle and more like a full-on country duet. McEntire and Rimes complemented each other well, since they both have strong voices with plenty of personality. In other words, they made the perfect team! We’d say their commercial is one of the best advertisements we’ve ever seen featuring country music singers. It’s seriously that good! Do you remember watching this commercial when it aired? Go ahead and relive it by checking it out in the video below!